Dual-Ended Earplug Free Case EvaluationQuick questions to get started. Hundreds of U.S. veterans have already filed lawsuits against the manufacturers and designers of dual-ended earplugs used by the military. On March 28, 2019, a panel of 7 Federal Judges (the Judicial Panel on Multidistrict Litigation) heard arguments from 21 different attorneys about consolidating cases from all over the country into an MDL action. These filed cases allege that defects in the earplug design caused hearing loss and tinnitus (ringing in the ear) in soldiers. They also allege that the manufacturers and designers of the product knew about the defects but did not inform the U.S. Government or individual soldiers. The U.S. Government has settled its case against the earplug makers, with the defendants agreeing to pay $9.1 million. This settlement does not include individual soldiers, however, so soldiers would need to pursue compensation on their own. Although some veterans already receive disability benefits for hearing loss/tinnitus, individual suits would likely claim additional types of damages. We are happy to discuss any questions you may have if you receive disability benefits for hearing loss that may have been caused by defective dual-ended earplugs. Call TodayWe are happy to answer questions. Dual-Ended Earplug Free Case EvaluationQuick questions to get started. The United States provided dual-ended earplugs to its soldiers between 2003 and 2015. These non-linear earplugs were intended to have two functionalities with an open end and a closed end. The closed end was intended to provide hearing protection against damaging sounds, including dangerous impulse noises while the open end was intended to allow the soldier to hear sounds such as a leader’s orders or approaching combatants. These dual-ended earplugs, which were olive green on one end and yellow on the other, were called the Combat ArmsTM dual-ended earplugs. The Combat ArmsTM dual-ended earplugs were designed and supplied by Aearo Technologies, Inc., and later 3M Company, from 2003 until 2015. Unfortunately, lawsuits allege that these earplugs did not operate as they were intended due to a design defect. The alleged design defect exposed U.S. military personnel to dangerous levels of sound and impulse noises, potentially causing hearing loss and tinnitus (ringing in the ears). There are further allegations that Aearo technologies and 3M knew about these defects but provided the defective earplugs anyway without giving any warning about the dangers they posed or ways to minimize the risks. 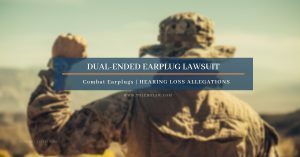 If you served in the military, believe you used these dual-ended earplugs and have been diagnosed with hearing loss, you may have a potential product liability claim. A False Claims Act case, or Qui Tam case, was filed against 3M in May 2016 alleging that 3M provided defective dual-ended earplugs that were tested with methods that did not comply with accepted standards and that 3M knowingly claimed Noise Reduction Ratings (NRR) that did not match the actual performance of the earplugs. The Qui Tam case also alleged that 3M submitted false claims to the U.S. government in supplying and requesting payment for the Dual-Ended Combat Arms™ Earplugs, version 2 (CAEv2), without disclosing the alleged design defect, flawed testing or inaccurate NRR that exposed U.S. military personnel to serious risk of hearing loss. A settlement between 3M and the U.S. Government was announced in July 2018, with 3M agreeing to pay $9.1 million dollars without making any admissions as to their liability. Current information suggests that from 2003-2015, the Combat Arm were the only dual-ended earplugs used by members of the U.S. Armed Forces. As described above, they were easily distinguished by their double cone-like ends that were olive green and yellow, respectively. Their defining characteristic was the closed end intended to block sound and the open end intended to allow the wearer to hear sounds. The yellow side of the earplug was intended to allow soldiers to hear commands and their fellow soldier and the olive green side of the earplug was intended to completely block sound. It is alleged that both sides of the earplugs failed to meet the specifications provided by the military. It is alleged that the stem of the dual-ended earplugs was too short to be properly inserted into the ear canal. As a result, the earplug would not seat properly in some wearers’ ears, resulting in the earplug loosening and for dangerous sounds to breach the ear canal. This exposure to dangerous sounds poses an increased risk of hearing loss. Why Another Lawsuit Against 3M? Through the Qui Tam case, the U.S. Government was able to seek justice and compensation for its damages. But the soldiers who have been injured by the alleged defects and deception are not included in that suit and must seek any desired compensation on their own. We value the men and women that serve our country and want to help them seek compensation for the damage to their hearing and detrimental effects on their long-term quality of life. Learn More, Talk To Us Today. Do You Have a Potential Hearing Loss Claim Against 3M for Their Dual-Ended Earplug? You may be entitled to compensation and we can assist you with a free case evaluation. Please contact us at your earliest convenience toll-free at 888-841-9623, fill out the form on this page, or utilize our 24 hour online chat services. No company should be allowed to knowingly put U.S. service members in harm’s way, prioritize profits over the safety of soldiers bravely fighting for our country and not be held accountable. Our attorneys are experienced plaintiff lawyers that have spent many years in the mass tort field. We anticipate a multidistrict litigation (MDL) will be formed for these cases. This will allow veterans allegedly injured by this defective device to file individual lawsuits while consolidating work on the common aspects of the cases. To learn more about how MDLs work and our extensive MDL experience, please visit our MDL page.